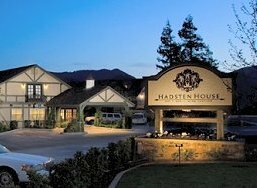 Happy, although a bit saddle-sore from riding the range, we gave our horsies a final pat and drove to the Hadsten House Inn and Spa in Solvang. Don’t let the modest exterior throw you, the HH is so not your everyday motor lodge. Newly renovated, it was styled-out cleverly, comfortably and creatively by an ex-Pottery Barn maven. With 72 well appointed rooms dressed in sophisticated hues of black, khaki and cream, with comfy feather beds, fireplaces, some with hot tubs, the vibe is European country-luxe. 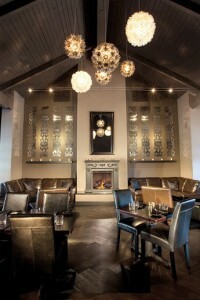 The Hadsten House Restaurant would not be out of place in Soho with it’s hip black leather, sensual dark wood and swanky silver accents, cozy fireplace and lofty beamed ceiling. The wine-country menu was simultaneously fun and sophisticated and refreshingly different, made all the more apparent after we opened with the house chips, an addictive tangle of Russet, Yukon and purple Peruvian potatoes tossed with cracked peppers, sea salt, parsley, truffle oil and parmesan cheese” and the scrumptious crab stuffed grilled prosciutto wrapped shrimp. My sis decided this would be the place to order her annual hamburger, which came with a choice of bacon, sauteed mushrooms, sauteed onions, sauteed spinach, avocado, fried egg, roasted peppers, goat cheese, Swiss cheese, cheddar cheese & jack cheese. She delicately looked up and said “ I’ll have them all, please.” After quickly scarfing down the mountain-sized concoction, she delicately napkined off her mouth corners, and declared it to be “absolutely perfect and well-worth every damn calorie.” I went the grown-up route and was equally delighted with the fresh seared Salmon, colorfully sided by spinach, roasted tomatoes, risotto cakes & dill buerre blanc sauce. Our dessert, a huge bowl of sizzling hot, cinnamony deep dish apple pie tasted even better than it smelled. Added Value: The stellar staff. Or server, Thomas, rocks and fills in nicely as the sommelier for the completely Santa Barbara wine list. Convenient and cozy, they offer a wide selection of treatments ranging from their signature wine country grape seed wrap, a distinctive honey contouring facial that really tightens, even a Reiki treatment complete with tuning forks. Andrea Saileanu, my facialist, had the most talented little hands as she soothed and patted away, while my sis couldn’t stop raving about her stellar massage with Kate. Tip: HH has the only indoor swimming pool in town. It was always nice and quiet for swimming laps and then you really feel like you deserve the complimentary wine and cheese tasting.